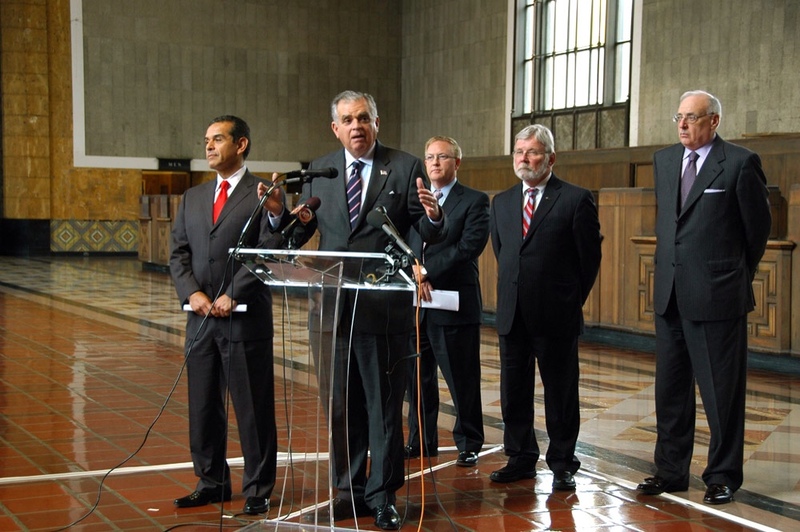 U.S. Transportation Secretary Ray LaHood was in Los Angeles on Tuesday and held a press availability at Union Station with local officials — including Los Angeles Mayor and Metro Board Chair Antonio Villaraigosa — to discuss California’s high-speed rail project. “For me this is an easy one,” Villaraigosa said. “We need to get on this train and we need to stand by the proposition that California needs to lead the way” when it comes to high-speed rail. Secretary LaHood echoed those comments, saying that the next generation of Americans will get around on high-speed rail, the reason that President Obama has pushed the issue. LaHood also praised California for being a leader by planning on a system with trains that will travel far faster than other high-speed rail projects in the U.S.
As expected, reporters asked about some of the critical reports and statements made about the California bullet train project’s business plan and the significant funding gap for a project estimated to cost at least $98 billion. Dan Richard, the new chairman of the California High-Speed Rail Authority Board, defended the project, saying that no one wants to build a system that people won’t want to ride. As Los Angeles Times columnist George Skelton reported Monday, Gov. Jerry Brown is considering making major changes to the state’s high-speed plans. Most notable would be possibly upgrading the commuter rail at either end of the line — Caltrain in the Bay Area and Metrolink in Southern California — to serve as bookends for a high-speed rail project. Brown has said that would signficantly lower the cost of the bullet train system. Metro has been working with the Obama Administration on several fronts, including high-speed rail, securing New Starts funds for the Westside Subway Extension and Regional Connector and helping shape the next multi-year transportation bill that is presently before Congress. Much cheaper to improve Amtrak – more efficiency, more frequent service, better advertising, a more comfy ride, and better connection. I second Sophie! Build a connection from Van Nuys to Bakersfield and improve Amtrak so that the ride between Los Angeles and San Francisco is about 4 1/2 hours. That’s about 1/3 the amount of time it is now, and faster than most people drive. And actually competitive with some of my experiences flying between Los Angeles and the Bay Area! An earlier Source post pointed out the benefits of positive train control in the midwest, where ordinary Amtrak trains now can travel 110 mph. This would easily be doable in the Central Valley.